In an unusual turn of events, I am sitting still today even though there are more important things I should be doing. I am not poorly, but I am out of steam after two weeks of globetrotting. Today is an essential recovery day before the final Christmas push. Happily the sun in shining into the living room and I am enveloped by the overwhelming fragrance of paperwhite narcissi, in their prime ten days too soon. Who cares? They are fabulous! The highlight of last week (and there were many contenders) was a day touring Dutch garden centres looking for Christmas inspiration. 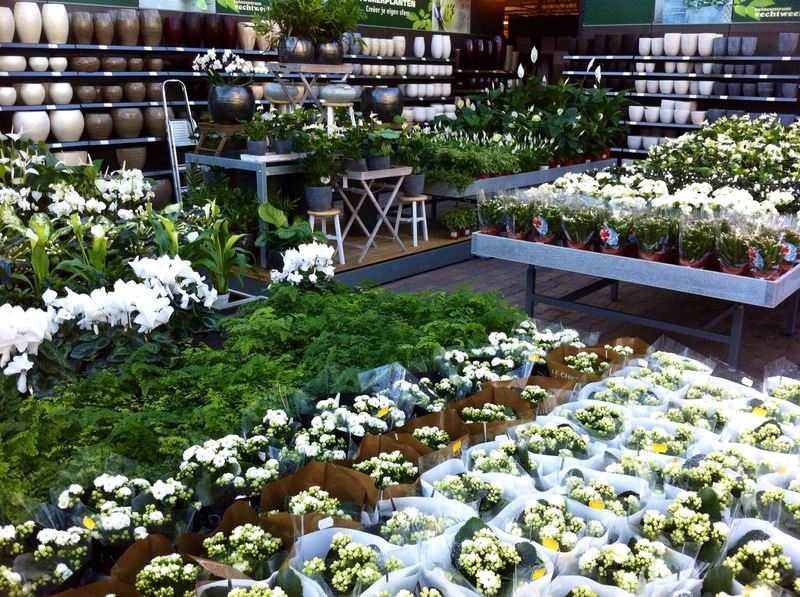 In the Low Countries, garden centres are on the scale of IKEA, dwarfing anything we’re accustomed to in the UK. House plants are very much treated as temporary decoration rather than something precious to be nurtured (or tortured) for months and years. The range is enormous. We were treated to beautifully presented displays of cyclamen, poinsettia, Phalenopsis, Kalanchoe, Spathiphyllum, begonias and ferns. 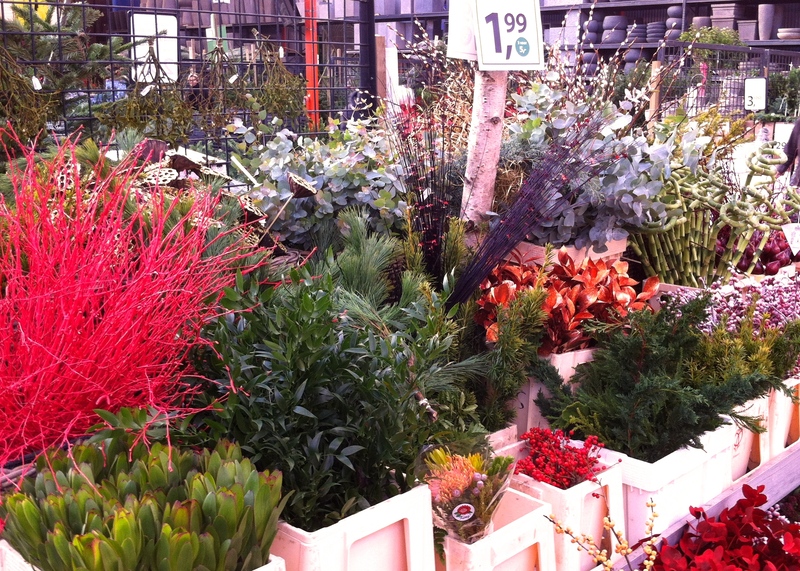 Plants were extremely well priced, most around 3 Euros a pop. If I’d had a means of transporting them home, I’d have bought trolley-loads. Some were planted up in mixed containers and dusted with glitter and snow. 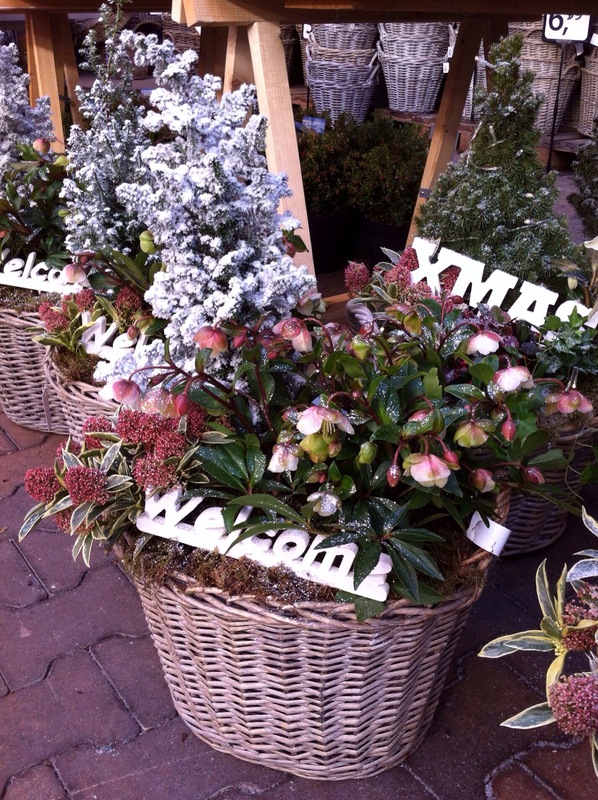 This sort of abomination normally makes me cringe, but wicker baskets filled with blush-pink hellebores, variegated Skimmia and snowy Picea were just about acceptable …. without the Welcome sign. 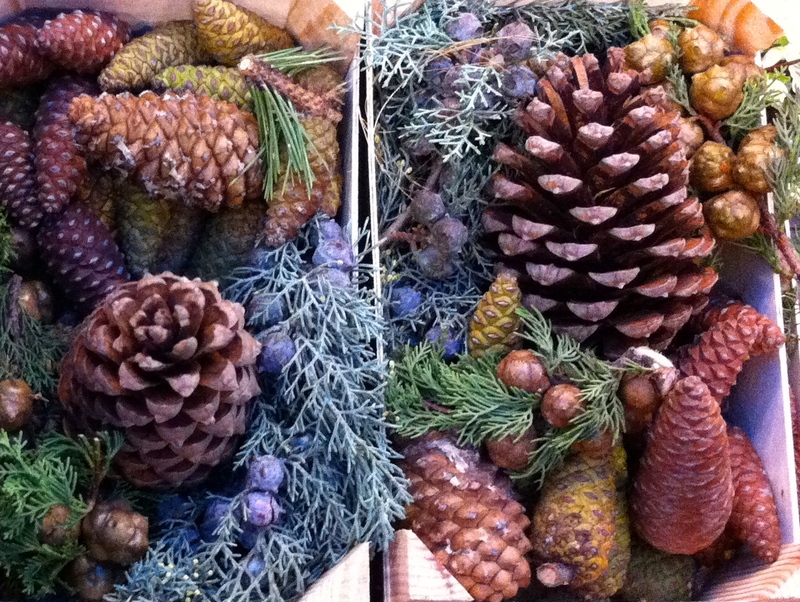 Freshly made wreaths, lush moss and resinous pine-cones were packed into little crates and neatly stacked, awaiting Christmas shoppers. The sheer volume of stock was quite incredible given the number of customers. The Christmas rush starts much later in Holland. 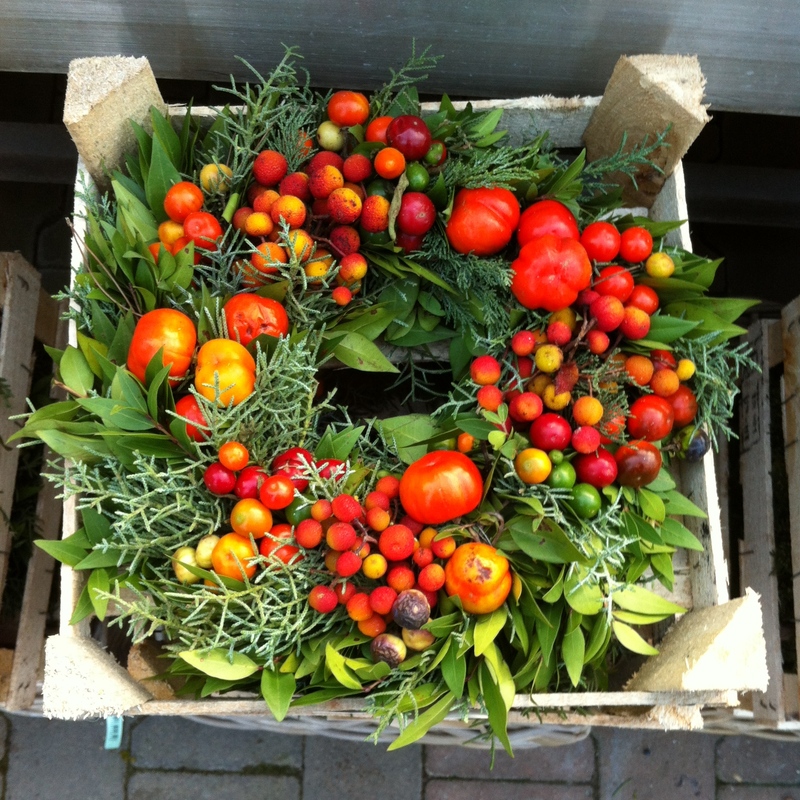 A wreath of berries, and what looked very much like tomatoes, was calling out to me to give it a home. Equally tempting were banks of cut stems, fresh and dried, for making Christmas arrangements. Three generous bundles could be purchased for 5 Euros – the makings of a substantial display. 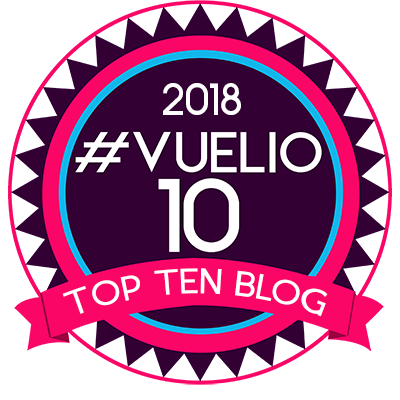 Denied access to these treasures, I instead bought some glass baubles painted with Delft-style windmills in blue and white – admittedly tacky (and sadly made in China), but not something you find everyday. There end my travels for 2013, except a trip to Peterborough next week, which will be something of comedown after New York, Paris, London and Amsterdam! Mr Jetset…now time to enjoy decorating your tree taking inspiration from these beautiful images with a glass of bubbles of course and a carol on the ipod, exquisite inspiration, and yes lose the welcome PLEASE! Special Rubbish items like garage door Christmas magnets ! !…these must be thought through so it is very funny and makes you smile not cringe! well that is an Aussie perspective anyway….